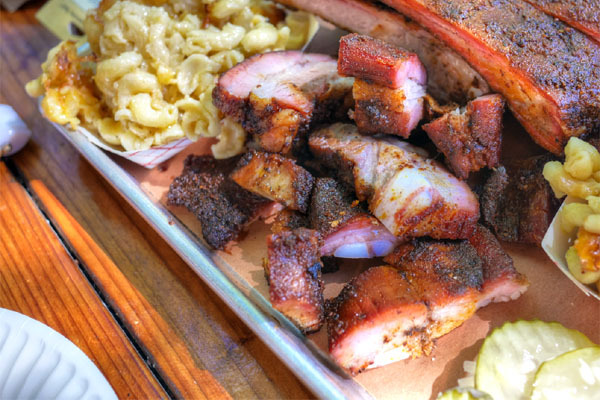 One of the newest entrants to LA's BBQ game is Grand Central Market's Horse Thief, a Lone Star-style operation that comes to us from O.G. Texans Russell Malixi and Wade McElroy. 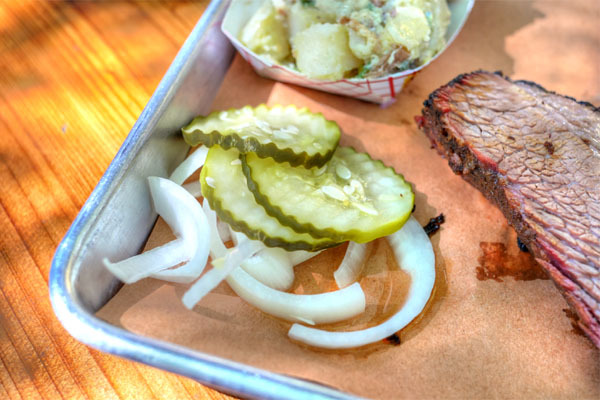 The two friends met while studying at the University of Texas at Austin, and though they pursued separate paths after graduation, always held on to a passion for barbeque. The idea for Horse Thief actually came to McElroy back in 2012, and he soon called upon his old compatriot for assistance. 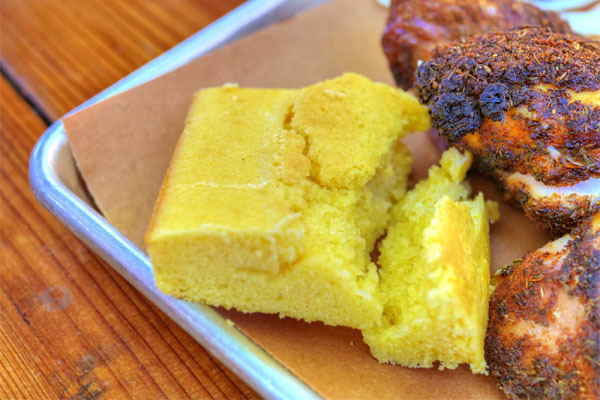 Once Malixi was on board, the duo started scouting locations and working on recipes before debuting their restaurant in July 2013, with Chef Max Henriquez (Mezze, Little Dom's) at the helm of the place's Ole Hickory smokers. 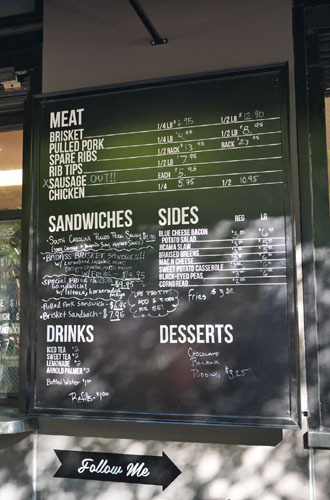 Horse Thief occupies GCM's outdoor space across the street from Angel's Flight. The stall was formerly Local Express and Chimu, and the adjacent patio area has been spruced up quite a bit since those days. As for Horse Thief's menu, it's pretty simple: five traditional cuts of meat (served with white bread, dill pickle chips, and onion), five new school-meets-old school sides, one requisite dessert. To drink, you'll find a dozen craft beers on tap at a walk-up bar, a smattering of wine, and some non-boozy beverages as well. Click for a larger version. 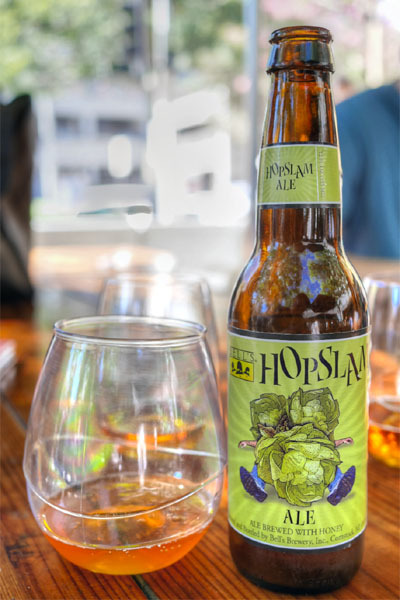 We ended up bringing our own beers, and began with the 2014 Bell's Hopslam, a superb IPA from Michigan. What set this one apart is the use of honey in the brew, which made for a fantastic balance between its sweetness and the aromatic, citric bitterness of the hops. 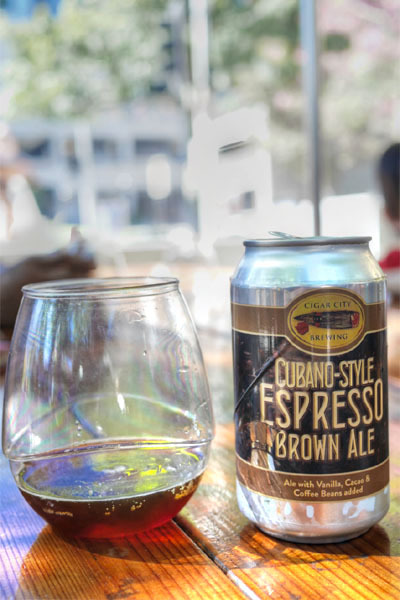 We then moved on to the 2014 Cigar City Cubano-Style Espresso Brown Ale with vanilla, espresso beans, and cacao nibs added. 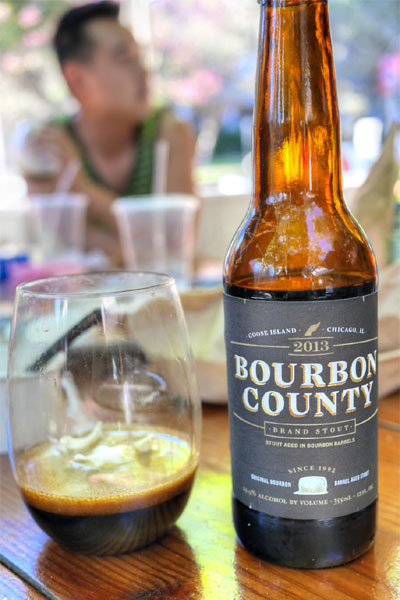 I was a fan of this one as well, finding it light in body, and somewhat dry, with a great interplay of coffee, caramel, malty, roasty, and nutty flavors. 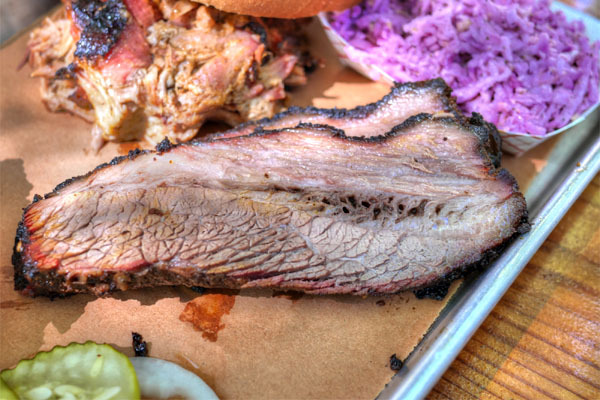 Naturally, given that this is a Texas-style joint, we had to start with the brisket, which I was pretty happy with. 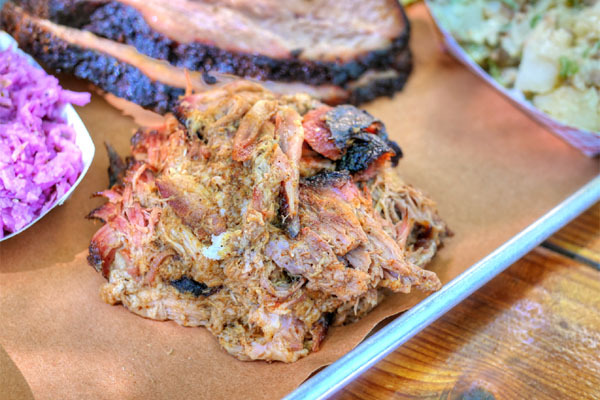 I found it appropriately tender, and just fatty enough, with a bit of smokiness to go along with the beefy flavors present. 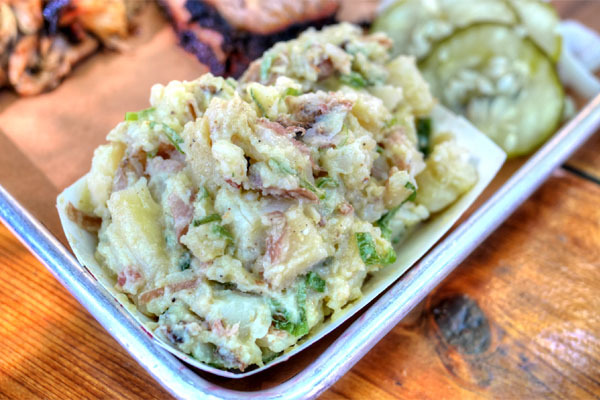 The potato salad was a must of course, and was one of the more interesting preparations I'd had thanks to the blue cheese. It definitely added an unexpected funkiness to the dish, one that was balanced out by the combo of bacon and scallion. Shards of onion and pickles come with every order and make for a crunchy counterpoint to the meat. The pulled pork could've used a touch more smokiness to it, but was otherwise quite tasty, with some much-appreciated crispy bits mixed in. 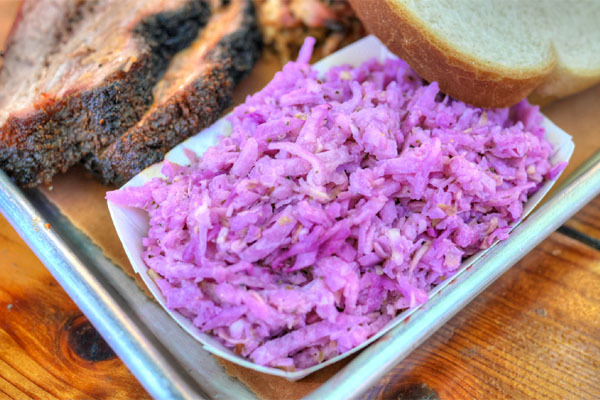 A slaw of red cabbage and jicama managed to be crunchy and refreshing, with a nice bit of acidity to it. The next beer was the vaunted 2014 Westvleteren 12, a pretty much perfect example of the quadrupel style, one teeming with soft, yet very apparent notes of dark fruit, brown sugar, and malt, all over a subtly yeasty backbone. 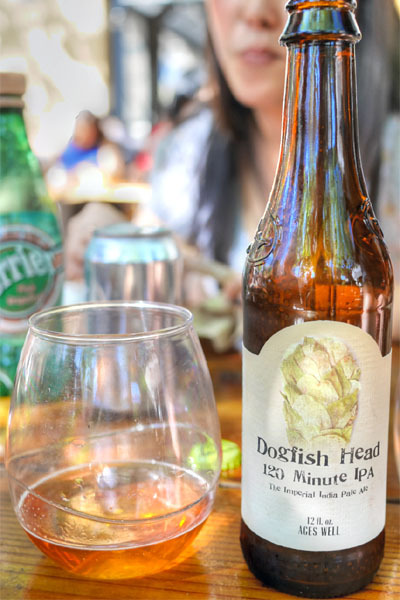 Following was the 2014 Dogfish Head 120 Minute IPA, one of the few IPAs recommended for aging, though we were drinking it fresh today. The beer was somewhat viscous in body, with a strongly spicy, pine-y, citrus-y hop quality as expected, evened out by a great underpinning of malt that made this surprisingly drinkable. 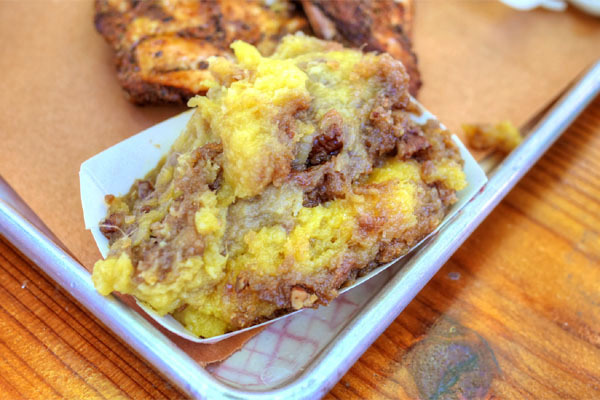 Rib tips were some of the more heavily-flavored bites of the meal, with a meaty, smoky character to 'em that made sense with their soft, cartilaginous consistency. The macaroni and cheese worked out pretty well, the hearty side coming out appropriately cheesy, with some delightful crispy bits on top. 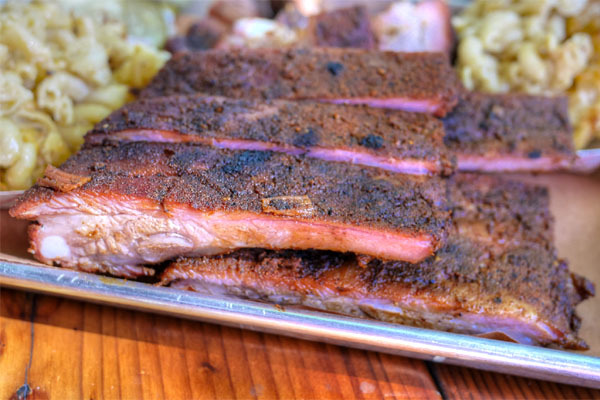 Pork spare ribs were well seasoned and nicely textured, showing off a sweet-smoky sort of flavor that satisfied. 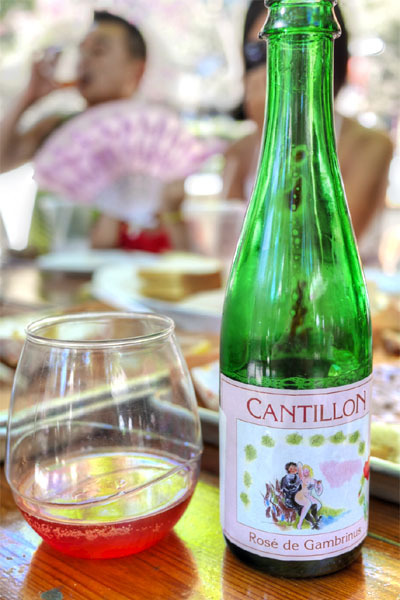 Time for a sour, the 2013 Cantillon Rosé De Gambrinus, a raspberry lambic. This one was quite something: beautifully ruby hued and utterly refreshing, with a fantastic fruity quality to go along with the beer's funky, tart base of flavor. 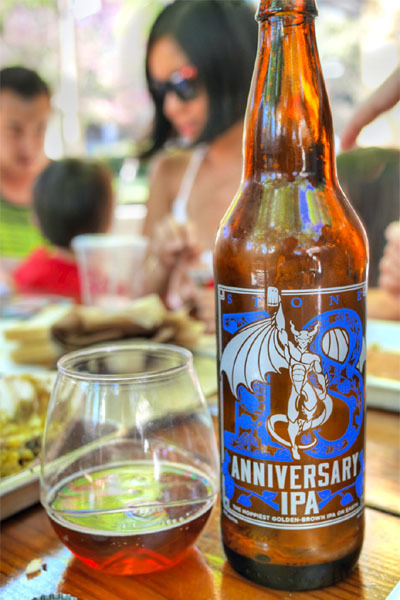 Next was the brand spankin' new 2014 Stone 18th Anniversary IPA, a surprisingly soft, darkly-toned rendition of the style that wasn't all that in-your-face hop-forward. 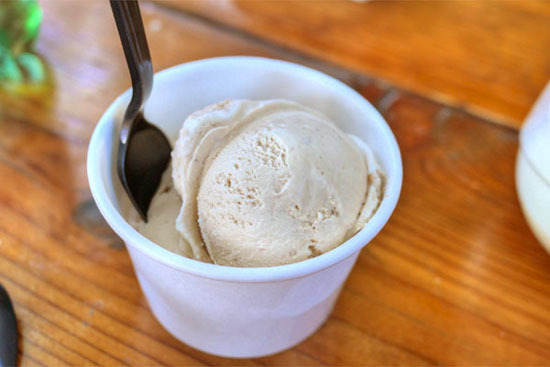 Instead, you got a more malt-heavy presentation, with a restrained citric character to even things out. Very cool. Even though it was far from the prettiest dish, my dining companions seemed to enjoy the sweet potato casserole. 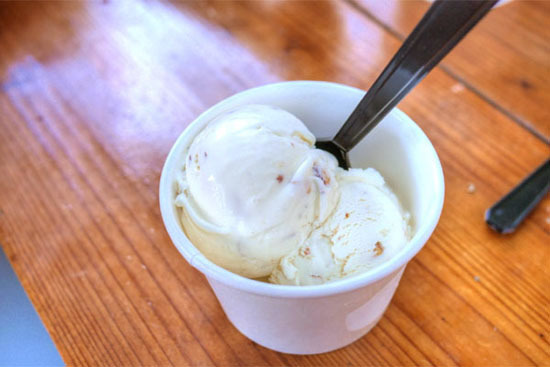 It veered overly sugary for me though, going into dessert territory thanks to its liberal use of brown sugar and what I believe were candied nuts. Our last meat was the chicken, the biggest surprise of the night. 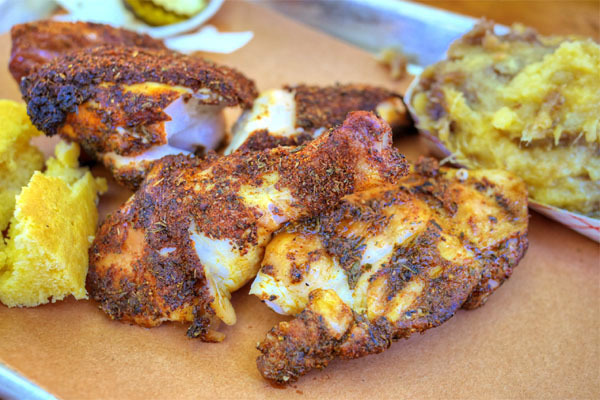 The bird was appropriately tender, juicy (though the breast could've been slightly more so), and flavorful, with a great rub that was just loaded with spicy, aromatic goodness. The cornbread, meanwhile, was quite sugary, and almost cake-y in body. I found it enjoyable, albeit a tad dry. 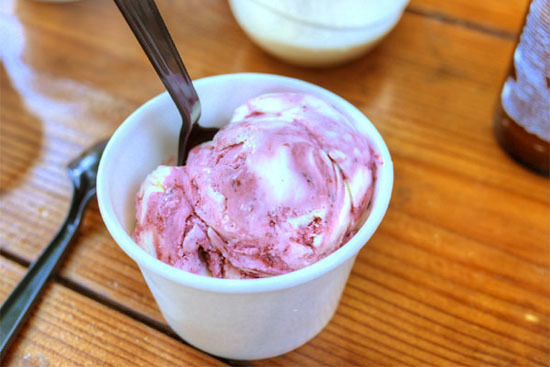 With the barbeque dispensed with, we moseyed on over to the new McConnell's Ice Cream stall, which opened at the end of July across from Wexler's Deli. 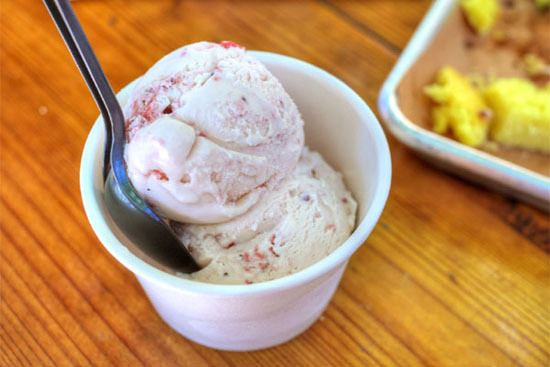 McConnell's, of course, is a well-regarded Santa Barbara-based creamery dating all the way back to 1949, one that'd been absent from LA proper for many years. 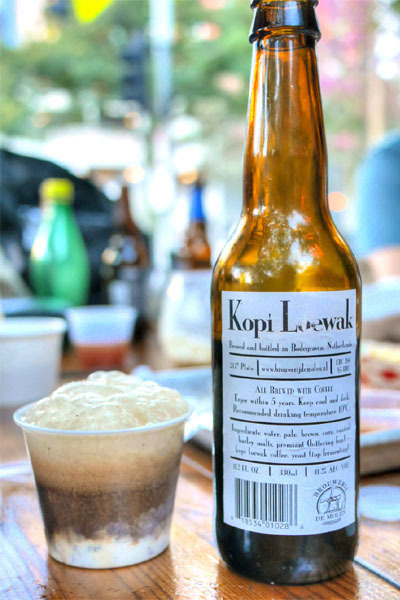 Our goal was to construct some beer floats, and to that effect, we started with this foursome of flavors: Santa Barbara Strawberry, Golden State Vanilla, Chocolate Almond Brittle, and Turkish Coffee. We started with the most traditional: McConnell's Golden State Vanilla paired with the 2013 Goose Island Bourbon County Brand Stout. 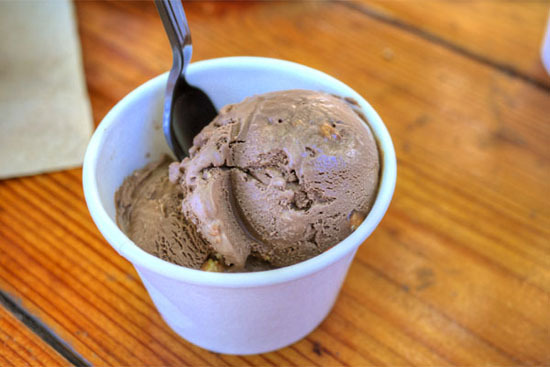 There's a reason why this is a classic combo, the light, creamy, floral nuances of the ice cream melding swimmingly with the thick, chocolate-y, wood-tinged, and yes, vanilla-laced flavors of the beer. As good as that was, though, Turkish Coffee with a splash of 2013 Goose Island Bourbon County Brand Coffee Stout was even better. 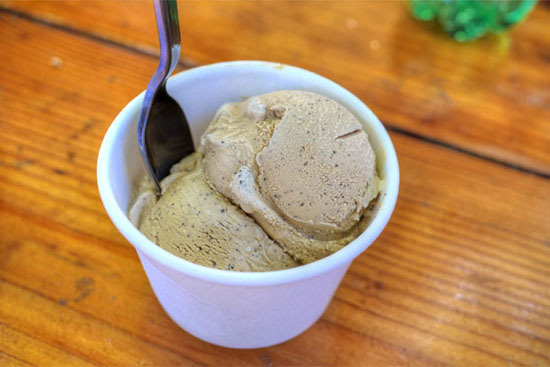 The ice cream itself was probably the most intensely coffee-like of any coffee ice cream I've had, but was taken to another level with the application of the beer, which had all the qualities of the proceeding BCBS, but with an additional blast of roasty, slightly fruity coffee character. And another great pairing? Either of these two beers with the Chocolate Almond Brittle. The two Bourbon County floats were excellent, but my favorite just might've been the marriage of Santa Barbara Strawberry and Brasserie Dieu Du Ciel Rosée D'hibiscus. 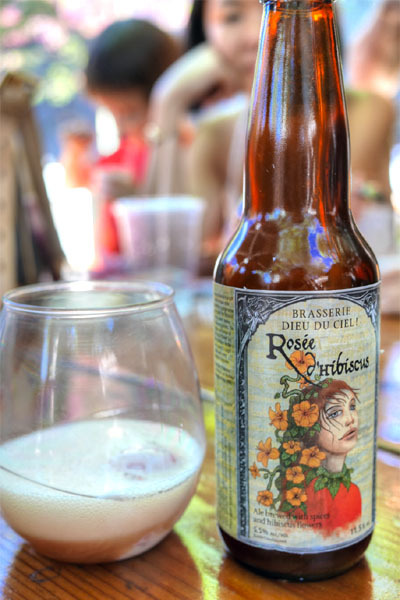 The matching of sweet-tart berry flavors with the absolutely floral, fragrant, hibiscus-tinged tipple was seriously spot on, and I loved the slightly wheaty quality of the beer as a counterpoint. 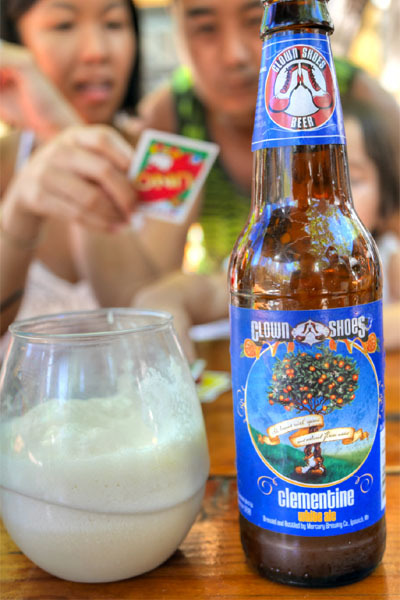 We then went back to the Golden State Vanilla, and matched it with the Clown Shoes Clementine, a Belgian-style witbier. This one was also really satisfying, with the citrus-y nature of the beer mixing with the ice cream to make for an orange Creamsicle-esque experience. 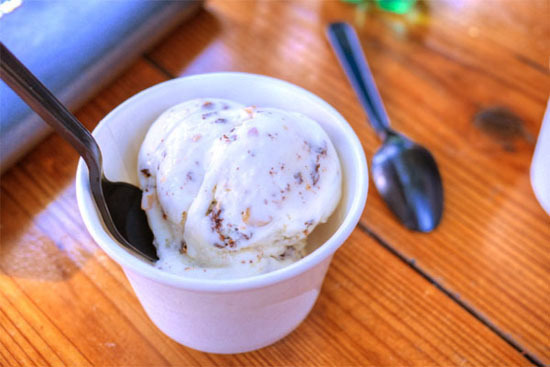 Encouraged by our results, we opted for another round, this time with McConnell's' Churros con Leche, Toasted Coconut Almond Chip, Eureka Lemon & Marionberries, and Olive Oil & Salted Almonds. 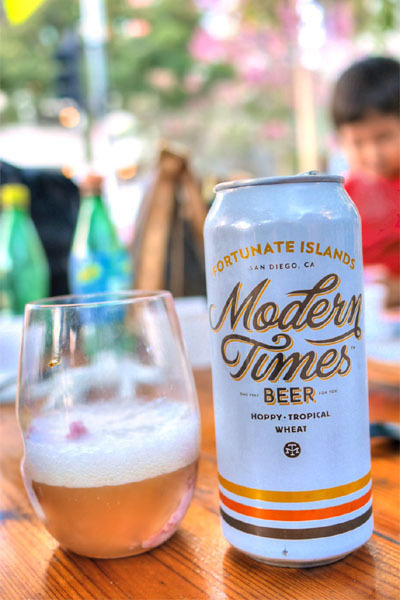 Here we had a Modern Times Fortunate Islands, blended with McConnell's' Eureka Lemon & Marionberries. 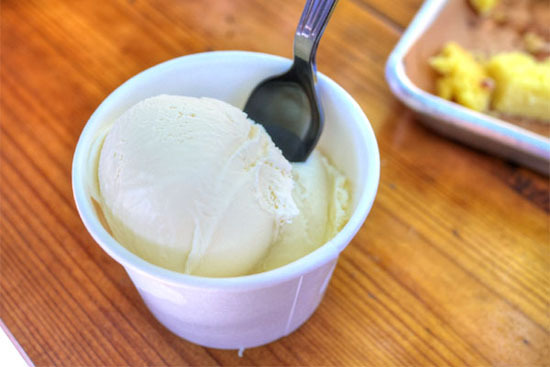 It was a pleasant, though not mind-blowing concoction, with the sweet and sour zing of the ice cream meshing pretty well with the tropical notes in the beer. Last up was the mating of Toasted Coconut Almond Chip with Brouwerij De Molen Kopi Loewak, another standout. 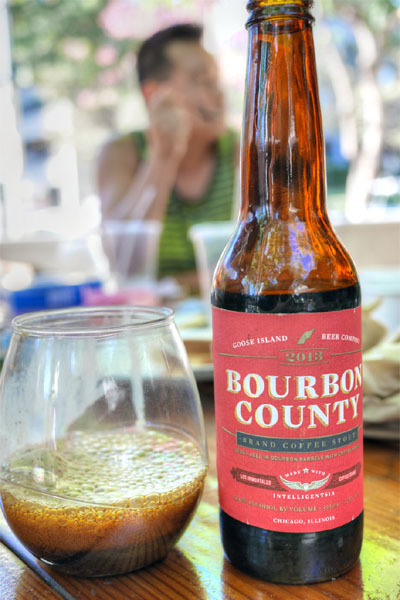 The beer was loaded with flavors of chocolate, toffee, nuts, roast, and coffee of course, a profile that was just wonderful against the troika of coconut, almond, and chocolate chip--outstanding. 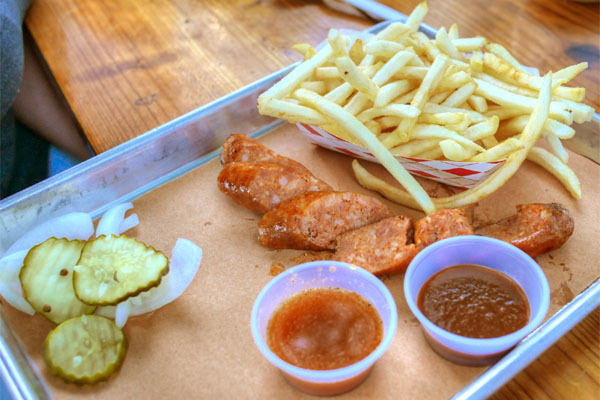 Finally, though the sausage was listed as being sold out, somehow the kitchen managed to finagle a final link and sent it our way, along with some off-menu French fries. It was a decent representation of cased meat, conveying a somewhat gritty texture and a touch of spice, though I would've liked it juicier. As for the fries, they were probably the closest I've come to McDonald's fries outside of McDonald's, and that's not necessarily a bad thing. I'd heard some mixed reviews about this place, so I'm glad to report that Horse Thief managed to exceed expectations. We had a solid meal here, with all the meats making a respectable showing for themselves, the brisket, appropriately, being one of the highlights. 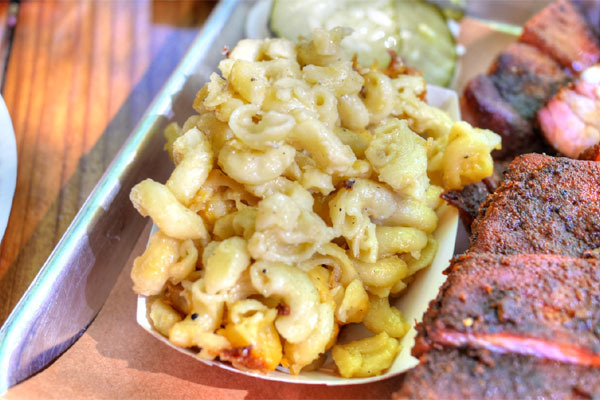 It was a tasty exploration of Texas barbeque, with some unconventional sides thrown in for good measure, and a fun experience to boot. i think the mixed reviews have to do with consistency. I've gone when the brisket is really tough and not fatty enough, when other days it's really moist and delicious. Same time for lunch just different days. Love that GI Coffee stout, might be my favorite stout out there! Check out Modern Times most recent limited release, Phalanx. There might be a few floating around (not sure how fresh now as it was released three weeks ago). Really pretty soft floral beer. 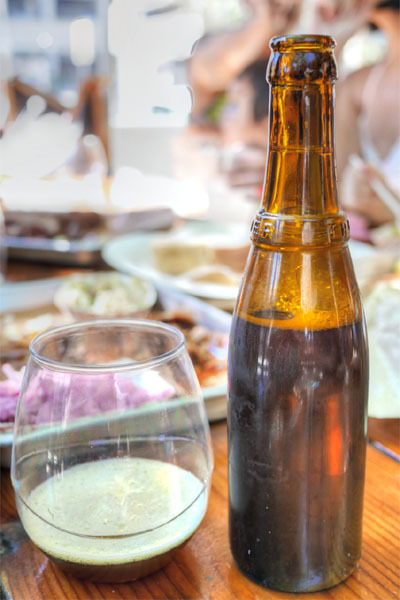 Where did you manage to snag a Westvleteren 12?? Charlie: Appreciate the further insight on this place. Will keep an eye out for that Phalanx too! Frank: Coincidentally, this particular bottle came from Mr. Fu above. Anon: Hadn't heard of that place, but I'll add it to my list to check out.